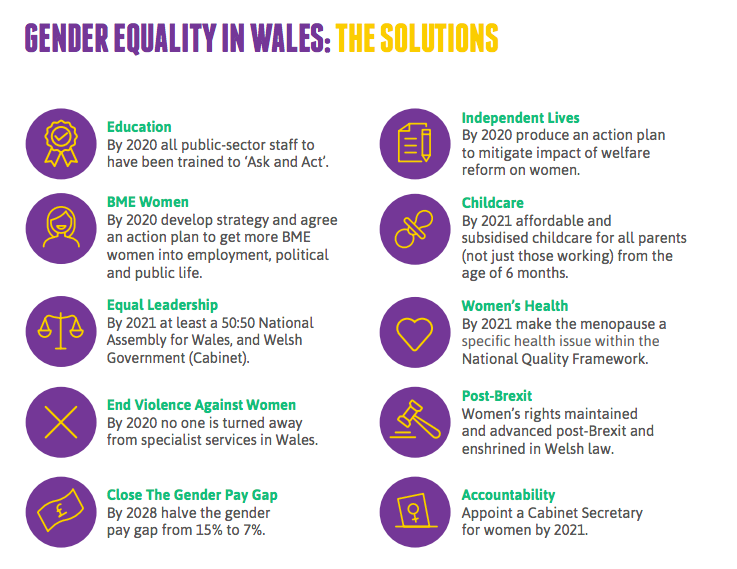 Our Manifesto will set Wales on the path to achieving gender equality, as ambitious action is needed now to break down the barriers to women and girls getting true equality. We worked with our sisters at Chwarae Teg, Women Connect First and Welsh Women’s Aid on a collective vision of Wales where every woman and girl is treated equally, is able to fully participate in the economy, public life and political life and live safe from violence and fear. The manifesto calls for the following ten solutions to be implemented as soon as possible so that equality is a reality. Deeds not words. Working together, gender inequality in Wales can become a reality in our lifetimes. Please download the full manifesto here.